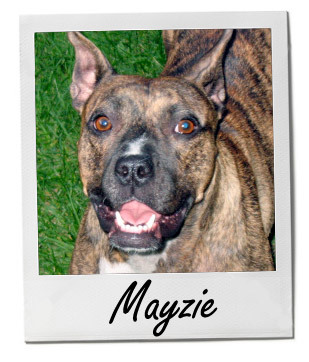 It was March of 2009 when Mayzie was adopted by her loving family, where she would enjoy the love of her pet siblings, a terrier named Brudder Ranger and two cats: Smudge and Abby. The family of pets is taken care of by two loving parents who initially adopted Mayzie from a rescue after she survived her rough beginnings. Now, Mayzie and her family share their enthralling adventures through their blog and YouTube channel. There, they record their bold endeavors with a series of pictures and an occasional pensée from Mayzie herself. We hope that Mayzie and her help spread awareness of how great rescue dogs can be- you can learn more about Mayzie and her family on facebook or on Twitter.